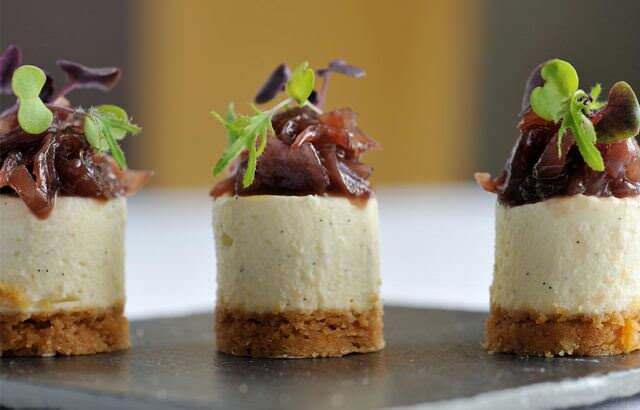 Limburger Cheesecake… only for the strong of heart or if you have a cold! Limburger Cheese! OH the wonderful smell of this cheese. Limburger is one of the cheeses that belongs to the “washed-rind” category. It is a real cheese, albeit not the most popular, at least in places where many Germans do not congregate. This is the cheese that my great grandfather loved on rye bread with raw onions and mustard, but only after it sat on top of the “ice box” for a few weeks. It’s taste is not as bad as it’s smell (thank god!). Once you trim away the rind, it has a slightly sweet, spicy flavor and is much milder than you’d expect. Washed-rind cheeses tend to be some of the highest regarded cheeses, at least amongst cheesemongers and other industry professionals and fanatics. Their complexity and richness of flavor even in pasteurized form makes them a satisfying group of cheeses for the table, to be enjoyed simply as a snack, with no embellishments or further preparation necessary. I however, love to turn them into wonderful deserts. So at the end of this article is a savory limburger cheesecake with a sweet onion, apple cayenne pepper chutney topping. Limburger is a “washed-rind” and this is the key to understanding the character of this type of cheese, Limburger included. Depending on the recipe for the specific cheese, this liquid can be brine (sometimes salt water) with herbs, beer, wine, aquavit, etc. Its effect on the cheese is to decrease its acidity. This step makes the rind a welcome place for the growth of Brevibacterium linens,or B. linens, a friendly, beneficial bacterium that causes the interior to soften during ripening (just like in the bloomy-rind cheeses), the rind to turn sticky and pinkish-orange, and the aroma to be illustrated by wavy green lines. This cheese smells bad. If you relied on smell alone, you might never eat this cheese but then you’d be missing out. While flavor varies by individual cheese, some common taste experiences of washed-rind cheeses are: eggy, sweet, beefy, pungent, creamy, spicy, buttery, and mustardy. It’s rare that a washed-rind cheese tastes as assertive as it smells, and if it does, it often means the cheese is past its peak and is no longer good. For those with a highly sensitive palate, I recommend trimming the rind. It can not only taste overwhelming, but its texture is often gritty. Then again, some people love the rind, so do what you like. NOW for those of you who are BRAVE of heart and love a challenge…. In blender, sprinkle gelatin over cold milk; let stand 2 min. Add hot milk and process at low until dissolved, about 2 min. Add limburger cheese, sugar and vanilla and process until blended. Arrange chocolate in bottom of crust. Pour in gelatin mixture. Chill until firm, about 2 hrs. In a saucepan over medium hight heat, sweat the onion in olive oil for 3-5 minutes. Reduce the heat to medium and cook covered for 30 minutes, stirring often to help break up the apples. For best results, chill overnight and serve cool to room temperature and place on cheesecake just before you serve. Passionate about artisan made gourmet food. Farmstead, handmade, regional, local, seasonal original and unique. Cheesecake…Basil…..Parmesan what do these have in common you ask?